With that in mind, we present our review of the Petzi Treat Cam, a camera with an integrated pet treat dispenser. 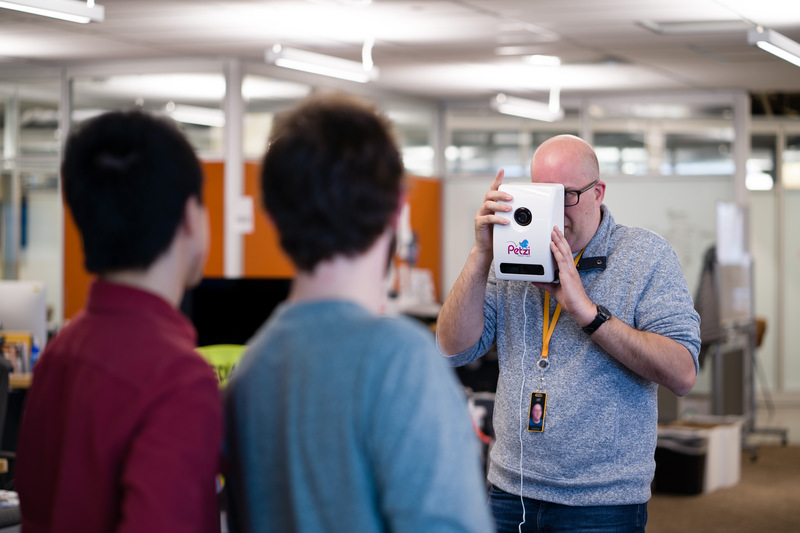 Unlike most cameras, which are designed to take with you, the Treat Cam is meant to be left at home. Once you’re in the field you can check in on Rover or Fluffy using the camera’s smartphone app, give out treats, take photos and even talk to your pets. What’s not to love? We tried to reproduce the Treat Cam’s unique feature set using a mirrorless camera, a bowl of pet treats, and a DPReview editor. It didn’t end well. Although the Petzi Treat Cam excels at some tasks, it’s not the best camera for hand-held use. Setting up the Treat Cam is a breeze. Create an account on the Petzi network, pair your phone with the camera using the Petzi app and – Shazam! – you’re connected. Pop off the plastic cover, fill it with treats and you’re ready for action. You can now leave your pets at home to scratch the furniture unabated, knowing you can check in on them anywhere, any time. Back home, the Treat Cam plays a chime to alert your pets that you’ve dropped in for a visit. Whether your pets actually care that you’ve made the effort is another matter entirely. In my early attempts to drop in on my cats from half a world away, I was usually met with a view of an empty room, because they were no doubt busy scratching the furniture elsewhere in the house. Stick with it, and you’ll be rewarded. Treat Cam has a built-in speaker so you can talk to your pets, or plead with them to please stop scratching the furniture. Unfortunately, there’s no corresponding microphone on the camera, so you won’t be able to hear them. You can also take photos to share with your friends or with your friends’ pets (more on this later). 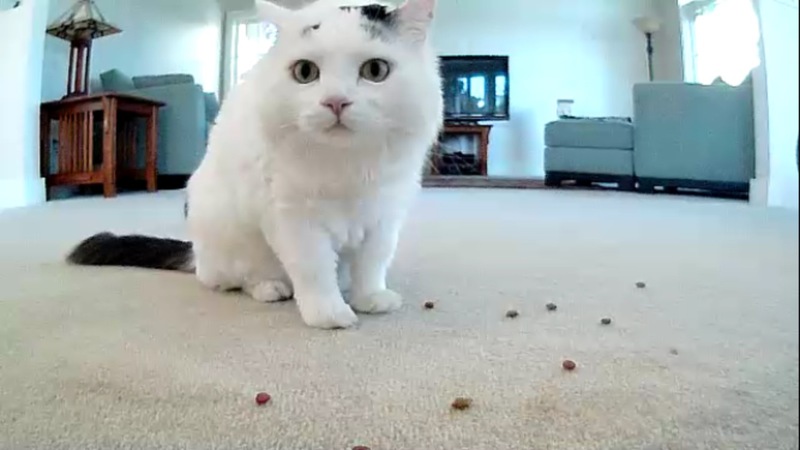 The Treat Cam lets you check in on your pets while away from home. Of course, the most important feature is the Treat Launcher. And launch, it does. This thing shoots treats like little projectiles, halfway across the room, and if you’ve loaded up the camera with extra small treats it becomes a little pet treat shotgun. Good stuff. 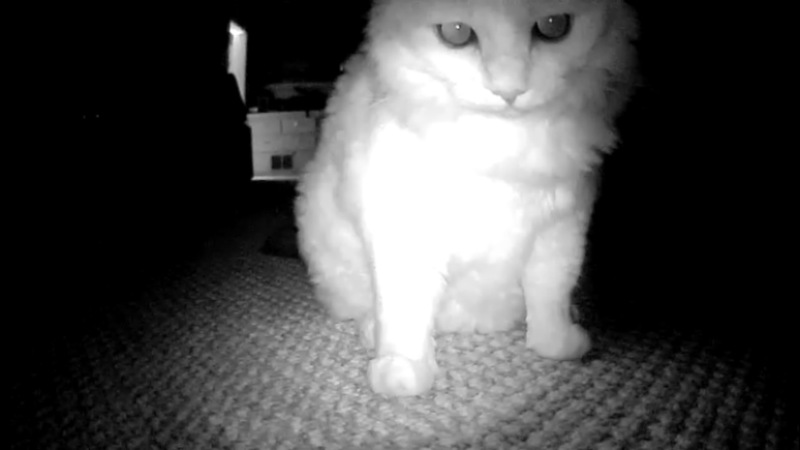 Finally, there’s a ‘night mode’, which activates an infrared light and switches to black and white, making the Treat Cam more usable in low light settings. Treat Cam has a built-in speaker so you can talk to your pets, or plead with them to please stop scratching the furniture. The entire process is a learning experience for both you and your pets. Over time, my cats learned to recognize the Treat Cam’s chime and now show up quickly when I connect. I’d like to believe they’re showing up for the engaging conversation. Of course, this is DPReview and we know what all you pet-owning photographers really care about image quality, so we took the Treat Cam into the studio and shot our test scene. 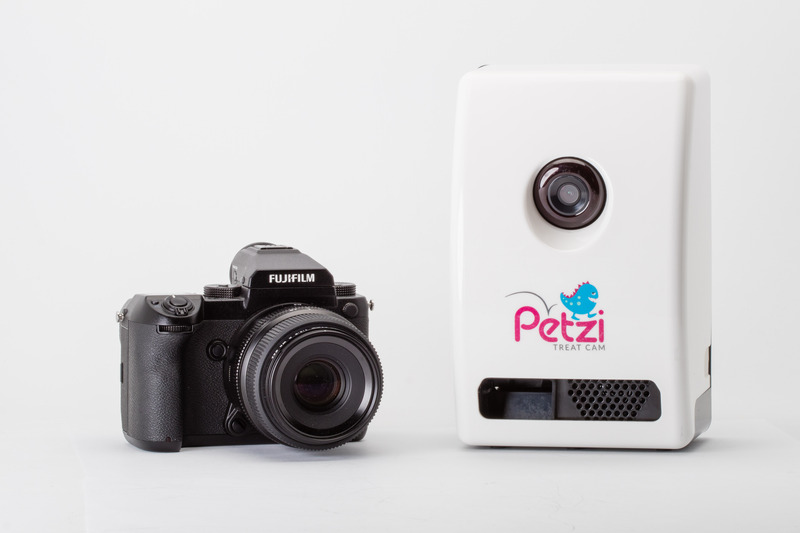 The Petzi Treat Cam has modest resolution and exhibits some barrel distortion, but it’s also the only camera we’ve tested that can fire pet treats back at the test scene. As always, tradeoffs. A quick glance at the image reveals a fair amount of barrel distortion. OK, there’s a lot of barrel distortion, but this isn’t exactly an architectural camera we’re talking about. In practice, the chart reveals more distortion than you’re likely to see in real world photos. Unless, of course, your pets are shaped like squares or wearing a test chart. The Treat Cam loses a few points when it comes to image quality, and resolution is not particularly high. We tried to determine the camera’s exact resolution, but after a bit of testing discovered that it always matches the resolution of our phone screen. Yep – the app is basically taking a screen shot and saving it to your camera roll. 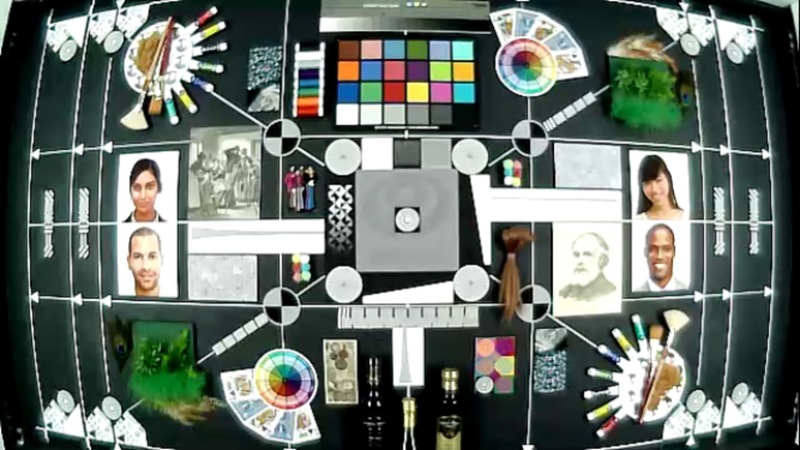 It occurred to us that we could probably calculate the exact resolution with a bit of additional analysis, but to be honest it was a lot more fun to shoot M&Ms out of the camera and we got sidetracked doing that instead. Your dogs or cats may not be on Facebook, but that doesn’t mean they can’t do social media. Your pets can create their own profiles on the Petzi network (likely, with your assistance), post pictures, and even follow your friends’ pets. My cats have been friends with Jeff Keller’s cats for a few months, and we’d like to believe it’s having a positive impact on their social experience. 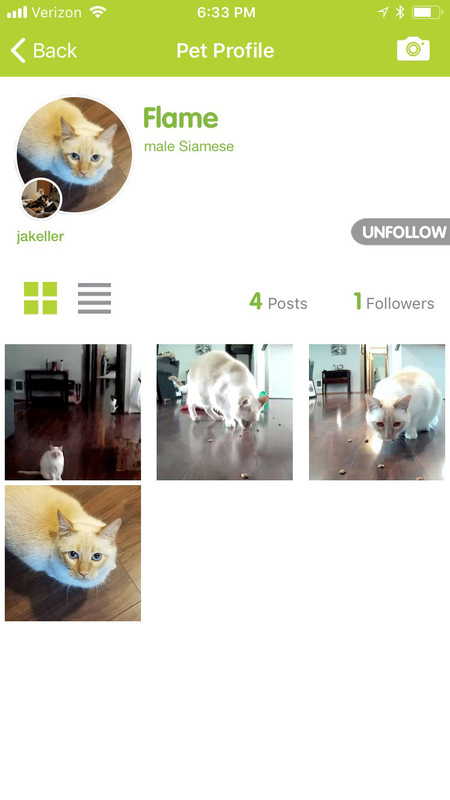 With the Petzi app, your pets can follow other pets. Or, at least you can pretend they do. Of course, social networks are social networks, and you can’t force anyone to like you. Wenmei Hill’s dogs have yet to accept my cats’ friend requests, and I think they’re starting to feel a bit miffed. If you don’t want to use the Petzi network, it’s easy enough to share photos on human-powered networks like Facebook and Twitter as well. The Petzi is the first camera with an integrated pet feeder we’ve reviewed and our options for comparison were limited, so we decided to compare it to the medium format Fujifilm GFX 50S. Because why not. As this table shows, it’s possible to make any camera look impressive by choosing the right things to compare, and the Treat Cam doesn’t disappoint. Although the GFX 50S has an impressive 50MP resolution, it costs $6500, lacks a dedicated social network, and most importantly, does not include an integrated pet feeder. The Petzi Treat Cam next to the Fujifilm GFX 50S for scale. As with any choice, this one comes down to what’s most important to you: high resolution, dynamic range and precision optics, or the ability to bond with your pets from half a world away by shooting dog biscuits from your phone. Without making any judgements, its a deeply personal decision. If you’re a frequent traveler with pets at home, a product like the Petzi Treat Cam is a no-brainer. It’s an easy way to drop in on your pets and give them treats while you’re away. However, thanks to our extensive field tests we can provide some pragmatic advice to potential buyers. The treat cam works pretty well with dogs right out of the box, probably because that little Petzi chime gets them excited every time it goes off, even if they don’t know why. Dogs are pretty easy that way. Night mode is useful if it’s dark when you call home. Cats don’t respond quite as quickly to the Petzi, possibly due to the fact that they’re so busy scratching the furniture while you’re gone. However, once they make the association between the chime and chicken treats that appear out of thin air they’re pretty good at coming over to say hi as well. We had less success with fish, hamsters, tropical birds, snakes, iguanas and flying squirrels, but your mileage may vary. Let us know if you have any luck with these. 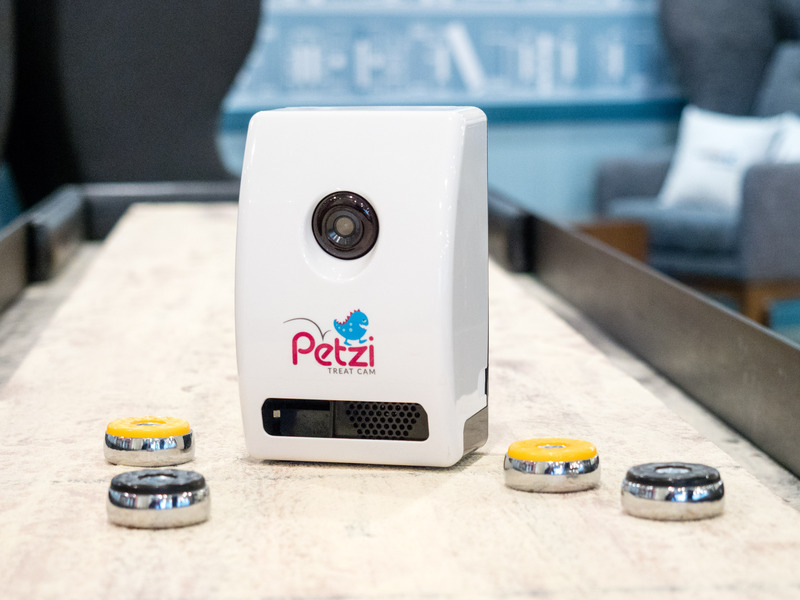 The Petzi Treat Cam is the first integrated pet feeder camera we’ve reviewed, and we’re generally impressed. Sure, you might give up certain features found in higher end cameras, such as resolution and image quality, but as we all know, specs aren’t everything. After all, if you’ve ever tried to feed your pet over the Internet using a DSLR (and let’s be honest, who hasn’t) you’ll know exactly what we’re talking about. And for that reason, the Petzi earns a solid ‘Paws Up’ award from the DPReview team. In case it isn’t obvious at this point, we’d like to make it clear that we’re partaking in the great tradition of April Fool’s silliness with this review. Our pets took it very seriously, though. They don’t really get jokes.